Bet Anonymously on the 3D Roulette in BTC Play; Leave a Winner! Bitcoin casinos continue to proliferate online. While this is advantageous to bettors worldwide, it can, however, also work the opposite way, especially when players begin to have difficulties in finding top-quality games like the all-time favorite roulette. It is a good thing, then, that BTC Play features a remarkable game of roulette that is absolutely visually attractive. Therefore, Bitcoin bettors who also happen to be avid roulette players should check out this Bitcoin casino and get a first-hand experience of the excellent betting offered by its Bitcoin Roulette. What is truly amazing about BTC Play’s roulette is the fact that it is designed using the 3D technology. This does not only make it more fun to play Bitcoin Roulette, but it also gives bettors a realistic ambience that is similar to land-based casinos. As a result, players are guaranteed to enjoy the overall experience of betting on this 3D roulette. In addition, players also have two perspectives to see the roulette wheel as the ball finds the lucky pocket because an aerial shot of the wheel is shown for a more precise view. This Bitcoin roulette game boasts of a user-friendly interface. Designed to make betting easier and more convenient, the interface of this game is a great feature that will be ultimately appreciated by bettors, especially those who are just starting to explore the lucrative industry of betting with bitcoins. Players can choose from four chips—5, 10, 25, 100—which they can place by clicking on any of the inside and outside bets. Once all wagers have been placed, players simply have to click on the roulette wheel for it to start spinning. Adding funds to the account is very simple in BTC Play. After all, bettors will just have to copy the wallet address their account has been assigned to in order to send amounts in BTC. Alternatively, they can scan the QR code to successfully transfer bitcoins to their account. Once the deposits are instantly processed, bettors can begin using the credits within five to 10 minutes. Meanwhile, cashing out is easy as well. Players, however, should be advised that the minimum withdrawal amount is 0.10 BTC. Before players can bet in BTC Play, they are required to manually create an account. What is great in this registration process, though, is the fact that providing personal information like a valid and working email address is only optional. This means that those who want to receive promotional updates or have a way to restore forgotten passwords have the option to provide an email address. Otherwise, bettors are guaranteed to experience anonymity in betting on roulette and other games in this Bitcoin Casino. 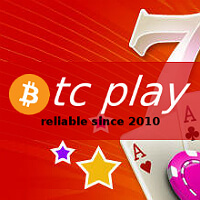 Contact support@btc-play.com for more information regarding the Bitcoin roulette and other games in this casino online.